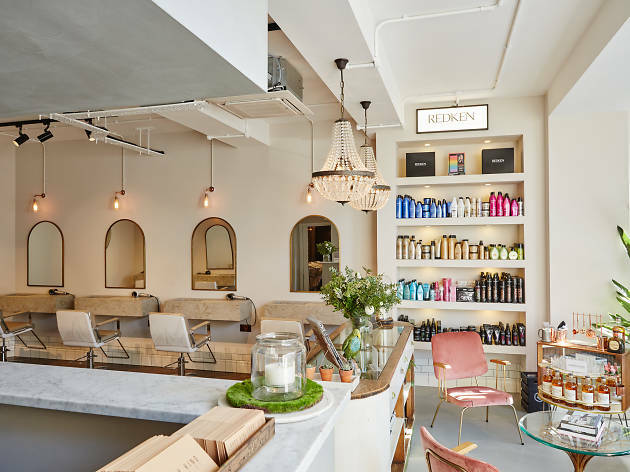 A lot of care and attention has gone into the design of this striking South Ken salon, which doesn’t actually feel very South Ken at all. It’s a little bit Brooklyn bachelor pad (industrial materials, masculine colours), and a little bit boudoir (velvet chairs, chandeliers and a retro cocktail trolley) – and it’s a mash-up that works. After settling down with a drink from the extensive menu (which includes a ‘cocktail of the day’), I opted for a hydrating Redken hair treatment from the Mask Bar, followed by a snip and blowdry from the man himself. Despite his list of mega-famous clients – that range from One Directioners to Cara Delevingne – Larry is refreshingly down to earth and up for a laugh, as are his hardworking staff. Anyone would feel welcome here. My cut was precise and I felt properly consulted about what I wanted, plus it kept its choppy shape several washes later. And I had my first encounter with a Dyson hairdryer (there was plenty of ‘ooh’-ing and ‘aah’-ing). 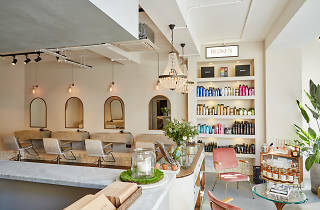 For some people, going to the hairdresser is a confusing, stressful experience, something that this place is attempting to change via a no-nonsense treatment list that addresses common concerns (eg how to protect your hair from sun damage). A stroke of genius, though, is the option to book a tutorial – your stylist will show you how to create salon looks yourself, and then send you off with a video of the session so you can practise at home. It’s clear the trendsetting Larry K is making waves – and not just with curling tongs.